please click and have a look!!!!!!!!!!! what is it? : a website to connect the “poor” to the “rich”; connect those who need help to those who can help. 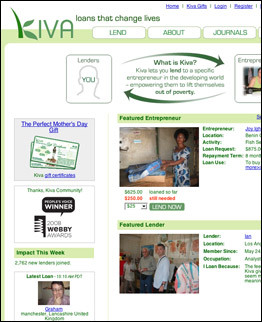 Kiva is a transparent, lending platform. what special? : you heard about social networking, facebook, myspace etc, ever imagine that this can help a person in the developing country? why help people? of course! and more, you’re not just ‘DONATing’ money, you get a unique experience connecting to a specific entrepreneur on the other side of the planet! why not? it’s cool! isn’t it?